From the founding director of the MIT Center for Collective Intelligence comes the first comprehensive look at the remarkable capacity for intelligence exhibited by groups of people and computers working together. Many people today are so dazzled by the long-term potential for artificial intelligence that they overlook the much clearer and more immediate potential for a new form of "collective intelligence": the intelligence of groups of people and computers working together. In Superminds, Thomas Malone argues that in order to take advantage of this potential, we need to do three things. First, we must realize that groups of people and computers are greater than the sums of their parts - that, in fact, these groups have minds of their own. Second, we need to understand how to help these collectively intelligent groups become even smarter. And third, we must learn how to harness their power to serve our interests. 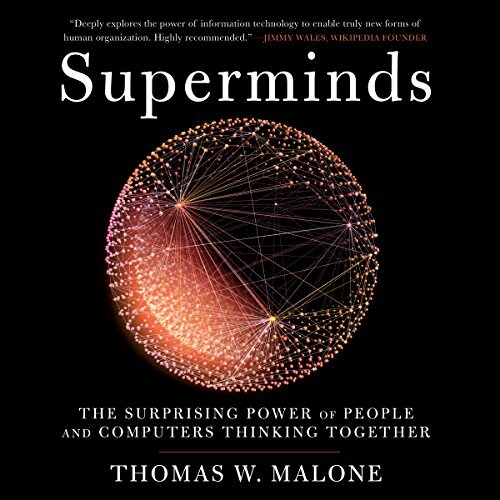 Groundbreaking and utterly fascinating, Superminds will change the way you work - both with others and with computers - for the better. ©2018 Thomas W. Malone (P)2018 Brilliance Publishing, Inc., all rights reserved. Explores our new Internet-enabled levels of collaboration (so it is not an individual's Supermind but a collective effort that is being addressed), but it is only one perspective, and you might say a 'fatal flaw in perception' since it is really about the average individual mind using new tools. The philosophical dabblings are vapid, venturing no further that semantic parlor games, especially with the definition of consciousness, where the author is clueless to the point of attributing consciousness to bureaucracies and corporations, which does nothing more than warp the definition and application. The author has a website that crowd-source-addresses climate change, which obviously inspired the 'supermind' perspective. There was too much speculation for me, more than other collective mind books (such as The Global Brain, which covered the phenomenon in various species, and which cited experiments rather than speculated). "Why did a Kenyan immigrant win the 2008 election"
Throughout the book, the author discusses the hive mind and how it relates to society in general, including the Internet, companies such as Apple 🍎, and group decisions, such as political elections. He puzzled at the end of the book, Why does our political system make the choices it does? And why did that person serve in this elective job? Well, I got an answer for him, imperfect information, including the fact that it was not known by some that that black candidate was not natural born, and therefore unable to run for office. In summary, like many technology related titles, the book is short on examples of where the supermind technology can go and where it is currently at.